Before embarking on my Indian odyssey, I had imagined that my time in Varanasi, reputed to be the most sacred city on earth, would be one of quiet, peaceful reflection. 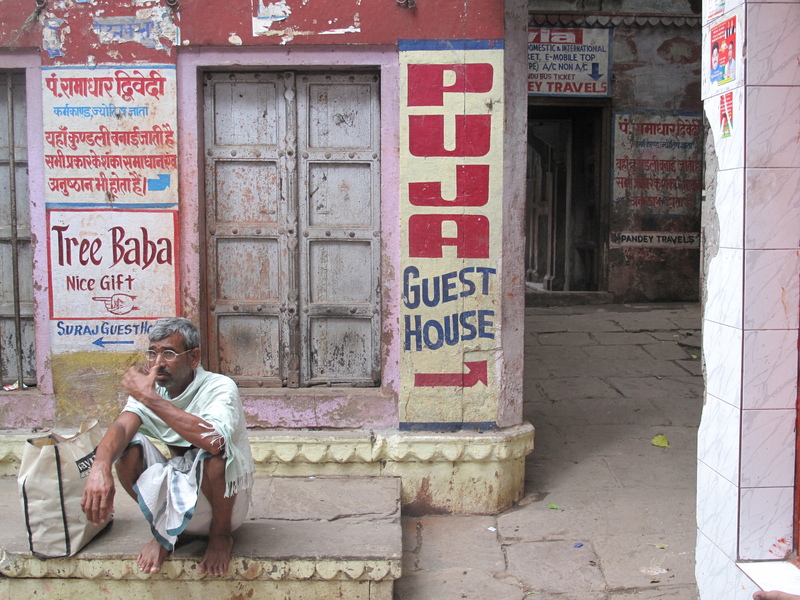 India doesn’t do peace and quiet, especially in Varanasi. The city side of the river Ganges is flanked by ghats, huge lines of stone steps leading down from the old city to the water’s edge. This is where 60,000 people from all over India come daily to perform their pujas (prayers) in order to absolve themselves of their misdeeds so they can ensure a better life next time round. It also includes those who are ailing or elderly, who rent rooms by the ghats and wait to die, or form groups of relatives who have brought their dead to one of the two burning ghats (more about this a little later). 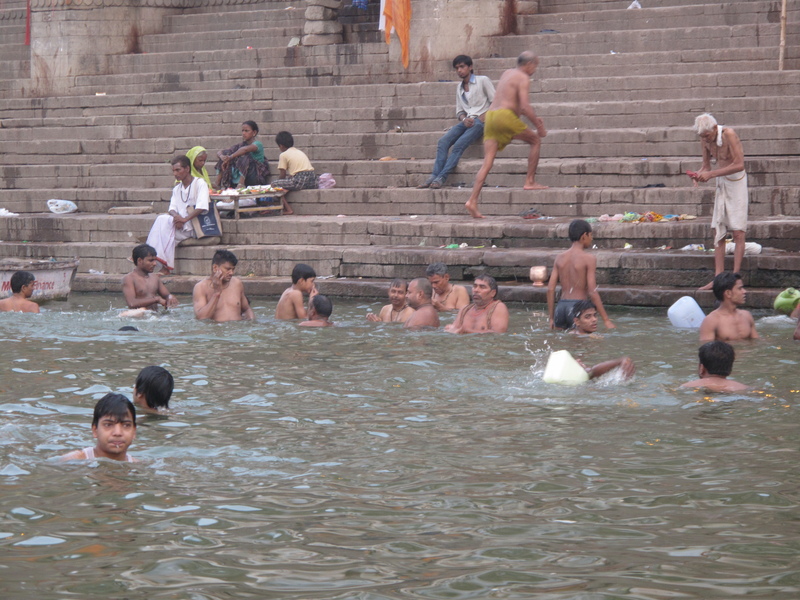 People bathing in the Ganges. The locals take full advantage of this frenetic human traffic flow, hawking boat trips, cheap jewellery, religious icons, all kinds of suspect refreshments, and, of course, other more nefarious activities. Prostitution is rife. Alongside, water buffalo wallow in the shallows, dogs dunk themselves to cool down, goats scramble over the stones, men pound sheets on wash stones, women delicately immerse themselves, children duck and dive, and blow water spouts at each other, fishermen haul up their nets, and the odd dead body drifts past along with the steady flow of Ganges litter. But I had no idea about this until I arrived. 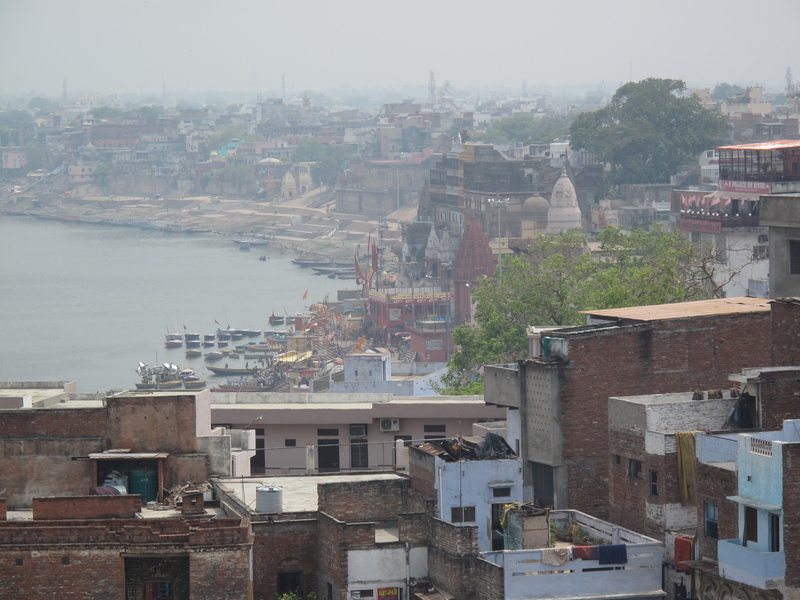 I flew into Varanasi on a day when the temperature peaked at a bone-melting 43 degrees. The journey from the airport was okay, apart from the taxi driver offering to take me to see his home. ‘Where exactly?’ I asked, beginning to feel a little tense. ‘You buy me chi,’ he answered, hauling my suitcase out of the boot. The driver started to get irate, but a young Indian lad appeared from nowhere, swept me up and led me down a host of alleyways, promising to take me to the Puja Guesthouse. ‘Really? Which hospital?’ I asked, dodging a large cow pat through which he had just trundled my suitcase. ‘My grandmother fix it for me,’ Avi answered blithely, and swept, on batting dogs, goats and motorcyclists out of the way. Hmm, I thought as I trotted after him, I don’t think it quite works like that. But a few minutes later, true to his word, Avi led me down a grimy narrow lane in the back of beyond to the door of the Puja. ‘How much do you want?’ I asked, about to dig in my purse. He ushered me into a dark, cavernous reception area where I was greeted with a beaming smile from the young man behind the desk. Avi disappeared, promising to rescue Jo, my travelling companion, when she arrived from the airport – and who, like me, would be dumped by the taxi driver without having a clue where to go. After clambering up three flights of stairs, I entered my room. The one good thing about it was the stunning view of the Ganges, but that was it. The loo didn’t work, the curtains were little better than rags, the sheets had holes and the air conditioning unit flooded water onto the tiny balcony. The roof-top café was even more of a disappointment: characterless and grubby, with a waiter who was a bit too arrogant for his own good. But at least it sold Kingfisher beer. A few hours later Avi reappeared with Jo in tow. But Avi hadn’t bargained on the arrival of Shiva, the Basil Fawlty of the Puja Guesthouse. Shiva threw him out, and immediately went into a diatribe about how these so-called guides hoodwink unsuspecting tourists into trusting them, and then fleece them for every penny. ‘You are my guests. I take care of you,’ he boomed. He then proceeded to harangue us about his ‘other business’, a silk shop. Chastened by this, Jo and I retired to our room to contemplate our plan of action for the next two days. This meant that Shiva ended up fleecing us instead of Avi. But we did enjoy a wonderful early morning boat trip to see the ghats further down river. 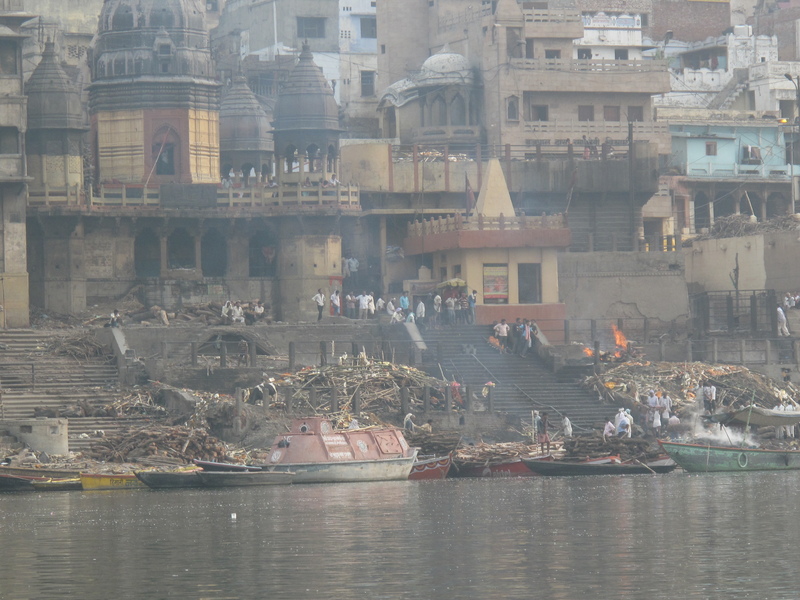 This included the two burning ghats where, among goats munching goodness-knows-what, dogs mating furiously, and priests picking their way over mountains of ash, more than 500 bodies a day are carted on the shoulders of relatives, immersed in the Ganges and then burnt on funeral pyres. The stench is dreadful, but even more dreadful is watching men, women and children bathing and swimming nearby. 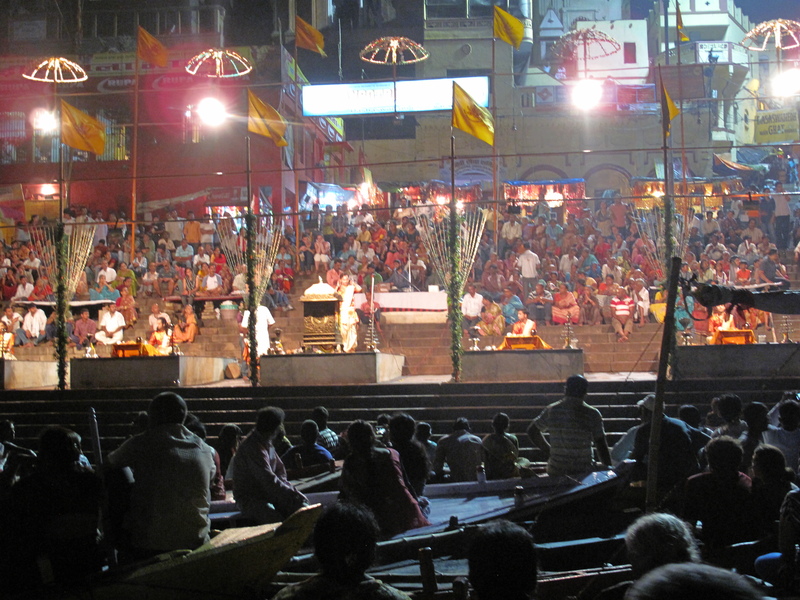 In the evening, we climbed on board another boat to be rowed to Dashaswamedh Ghat, where the famous Ganga Aarti ceremony is performed every evening after sunset. Yet as I watched this extraordinary spectacle, I couldn’t help but wonder why the locals are so willing to pray to their Holy Mother, but do bugger all to help reduce the horrendous pollution or deal with the very real concern that the entire Ganges is dying. It doesn’t make sense. Talking about dying, by the end of the second day, Shiva and the Puja Guesthouse were getting to me. Jo was about to move on, and I was feeling increasingly uncomfortable about staying there on my own. I was literally the only guest. Fortunately, from the Puja café we had spotted the roof terrace of another guesthouse sporting cheerful orange sun shades, and decided to pay it a visit. As soon as we walked into the tranquil setting of the Ganpati Guesthouse’s courtyard garden, and saw other western tourists lounging beside the fountain and reading books on the balcony, I knew this was the sanctuary I craved. 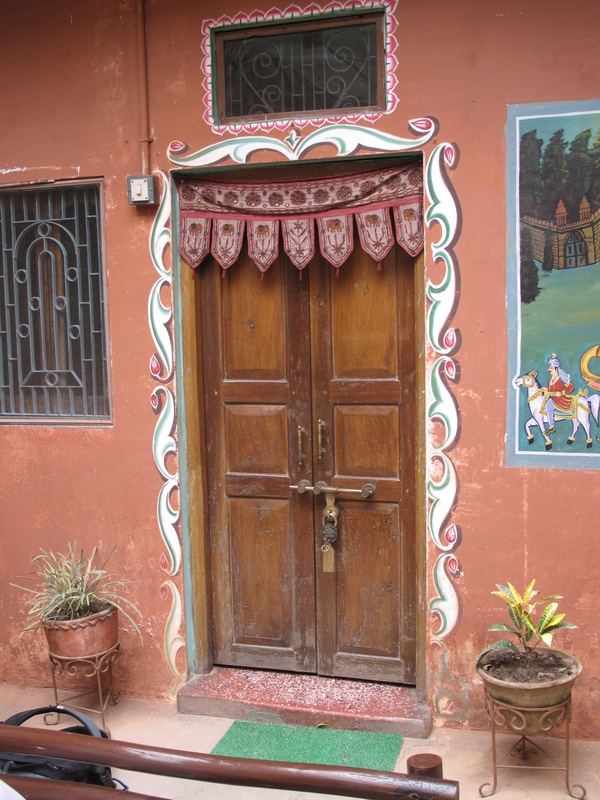 Within the hour I had packed my bags at the Puja and was unpacking them again in a bright yellow bedroom, situated off the courtyard garden, decorated with Indian wall hangings and cooled by an air conditioning unit that didn’t leak. The staff are delightful, respectful, and very helpful, to the point that when my Wi-Fi wouldn’t work, I was allowed to plug directly into the main computer system, so I could call on my personal computer support in the UK. It was truly surreal to watch computer expert in England (aka husband Mark) log on remotely from the comfort of our home in Cirencester to fix my computer in India. It made me feel very homesick. But the Ganpati is where I am until I leave for Delhi in two days time before heading to Vietnam. Full of mainly young European travellers who are all, just like me, gratefully taking refuge from the rigours of Varanasi, it’s a little haven from the madness and grime of the river Ganges. This entry was posted in All posts and tagged burning ghats, Ganga Aarti, Ganpati Guesthouse, The Ganges, Varanasi. Bookmark the permalink. Ditto to what Tree says. Your photos are delightfully evocative too, the slightly smoky haze, and the pinkish light. It makes me long to be with you. 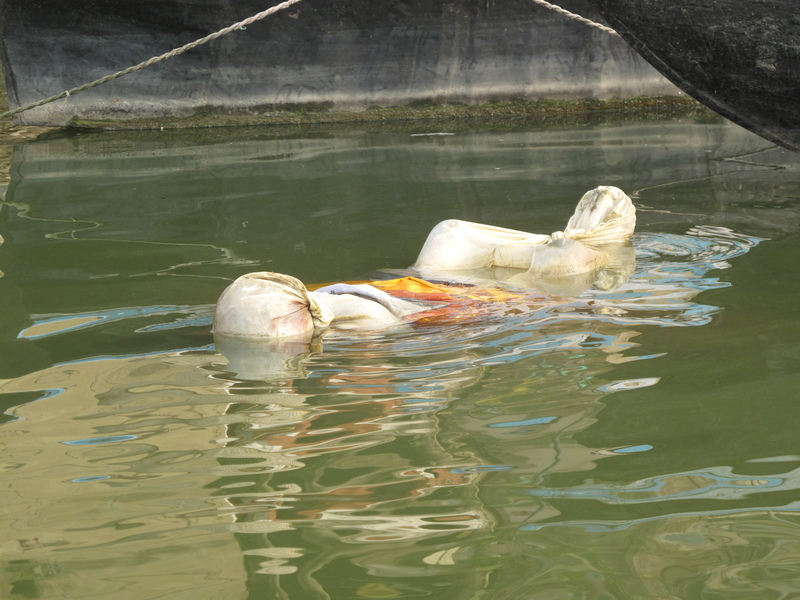 Even with the dead bodies … Hope you are boosting your immune system with much good nourishment? And that you are able to absorb the crazy frenetic energy, and roll with it. I’m so envious…. Here’s to India! Hi Sue! Ali and I send our best from the US as you adventure onward. We really enjoyed catching up on your entries and will look forward to reading more as you continue down the road (all hopefully smoother than the one connecting Delhi to Dharamasala). Cheers!